A Russian-built rocket engine assigned to launch an Orbital Sciences Corp. commercial resupply flight to the International Space Station in early 2015 was damaged Thursday during a test mishap at NASA's Stennis Space Center in Mississippi. "A test anomaly occurred earlier today at Stennis during an acceptance test of an AJ26 engine slated to fly in 2015," said Orbital Sciences spokesperson Barry Beneski. "The cause of the failure is unknown at this time." The Antares launch vehicle is powered by two AJ26-62 first stage main engines at the start of Orbital's commercial cargo missions to the space station. 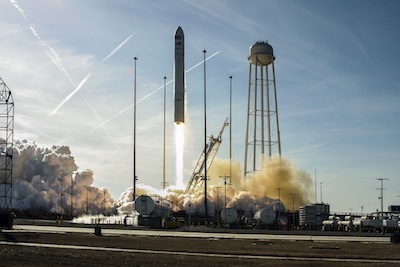 The Dulles, Va.-based company has a $1.9 billion contract for eight resupply flights through 2016 using Antares boosters and Cygnus logistics spaceships. Orbital has completed the first supply mission under the contract, and the second flight is scheduled for takeoff June 10 from NASA's Wallops Flight Facility in Virginia. "We don't know yet if this will affect the upcoming Antares launch schedule," Beneski wrote in an email. SpaceX holds a similar cargo contract with NASA to transport supplies to and from the space station using the company's Falcon 9 rocket and Dragon capsule. 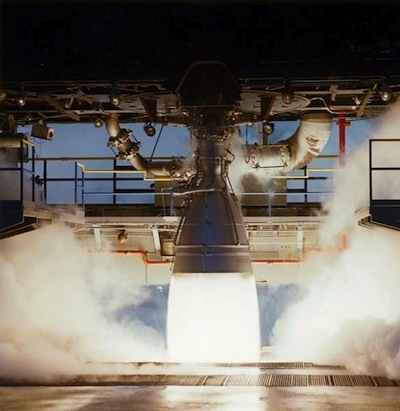 Aerojet Rocketdyne provides the AJ26 engines for Orbital's Antares launch vehicle. A spokesperson for the propulsion firm said there no injuries from Thursday's engine mishap, and the company is leading an investigation to determine the cause of the failure. Photo of an Antares launch on Jan. 9, 2014. Credit: Orbital Sciences Corp.
Aerojet purchased 43 NK-33 engines from Russia's Kuznetsov Design Bureau in the 1990s to integrate on U.S. rockets. The first American launch contractor to commit to using the engines was Orbital Sciences, which bought 20 engines for 10 flights, consisting of two test launches and the eight cargo deliveries to the space station. Aerojet Rocketdyne converted the 20 NK-33 engines into the AJ26 configuration by adding U.S. electronics, qualifying the engines for U.S. propellants, putting in equipment to permit the engines to gimbal for steering, and adding electromechanical valve actuators, according to officials familiar with the engine's modernization. The AJ26 engines consume liquid oxygen and rocket-grade kerosene propellants. Each engine generates more than 350,000 pounds of thrust at sea level. Officials said the AJ26 engine that failed Thursday suffered the anomaly about 30 seconds into a planned 54-second test. The engine test terminated prematurely, resulting in extensive damage to the engine. 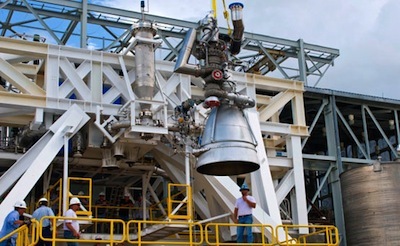 A team of NASA, Aerojet Rocketdyne, Orbital Sciences and Lockheed Martin engineers put each AJ26 engine through acceptance testing on the E-1 test stand at the Stennis Space Center in southern Mississippi before delivering the engines to the Antares launch site on Virginia's Eastern Shore. Engines for the next two Antares launches, currently scheduled for June 10 and early October, have finished acceptance testing and are ready for flight. But officials said Thursday it was too soon to tell whether the launches would be delayed in the aftermath of the engine mishap at Stennis. The first stage structures for the next three flights have also been delivered to the United States from Yuzhmash in Dnipropetrovsk, Ukraine, according to Frank Culbertson, executive vice president and general manager of Orbital's advanced programs group. In an interview Wednesday, Culbertson said two more Ukrainian stages were on schedule to arrive in the United States later this year.